I made the sauce in the morning, then did the eggplant and layering just before baking. The afternoon was kind of iffy, since I was doing lunch and working out with Yang and Bun-of-Secrets. But I needed dinner on the table quickly, before I went to see Panic! at the Disco with Cleopatra. I may or may not have begged her to come back from college to go with me because no one else wanted to go with. For this eggplant Parm, I used the largest skillet I had, and I wasn’t able to fit everything in. I even let the onions sweat down past translucent in hopes that I would be able to make enough space. I had to take out a container’s worth of onions (I’m betting about a whole onion) before I could add the tomatoes. I didn’t use San Marzano tomatoes. They were $2 more per can, and the Asian in me just couldn’t comprehend how much better these tomatoes would taste for the price of two In-n-Out burgers. FYI, the tomatoes are much easier to crush when they’ve warmed up a little. I like to stab my fork (gently) into the middle of the tomato so that no hot tomato juice comes gushing out towards your face. I used globe eggplants for this dish. Somehow, it just didn’t seem right subbing a Japanese eggplant in. Aside from the fact that you’d need a boatload of them to make up for their smaller diameter. I baked them off in three batches; make sure that you grease the baking sheet, or else the eggplant will stick like a mofo. I like to flip the slices so that the possibility of sticking is less, and so that both sides get nice and brown. The baking goes faster if the slices are thinner, but the slices are also harder to flip and remove from the baking sheet. It’s a toss-up. I ran out of mozzarella; I only had the fresh kind that you’re supposed to eat uncooked. When it’s cooked, it loses all of its great milky flavor, becomes rubbery, and releases way too much water. So instead, I used some cheddar. I didn’t have a whole bunch of basil, either, so I made do with a couple of stalks’ worth. I wasn’t too worried, however, since the tomatoes already came with some basil in them. This is my fault, but I didn’t take into account how much tomato sauce Guarnaschelli’s recipe made and how much the eggplant parm needed. I had way too much tomato sauce, so I’d suggest cutting down the tomatoes from 3 cans to 2, and using 1 onion instead of 3 (unless you really like onions, at which point I’d use 2). Make sure that you finish layering with the cheese (the panko can be on top, but that’s it). I had too much eggplant, so I used that for the last layer. As a result, the cheese didn’t get as brown and bubbly as I wanted it to. Let me say, MMM. The eggplant was meaty yet silky (I don’t think I cooked it enough, though, so it was probably more meaty than it should have been). The sauce was sweet from the onions and a touch tangy from the tomatoes, and I loved how chunky it was (chunkiness depends on how small you cut the onions and how much you crush the tomatoes). There was a depth from the two cheeses, and the melty cheese plus tomato sauce made it taste like a baked ziti (a plus in my book). I thought the panko was unnecessary, since it got lost amongst everything else. Would I make this eggplant Parm again? Maybe. It was pretty delicious and satisfying, but it’s a definite time commitment. Quick note: I have no idea why I did a mash-up rather than just use one recipe. I guess I just like to make my life hard. In a large skillet, heat 2 T oil over medium-high heat. Add onion and garlic; season with salt. Cook until onions become translucent, 3 to 5 minutes. Add sugar and tomatoes. Break up some of the tomatoes and cook 10 to 15 minutes over medium heat, stirring from time to time. The tomatoes should be fairly broken down and flavors coming together. Cool. 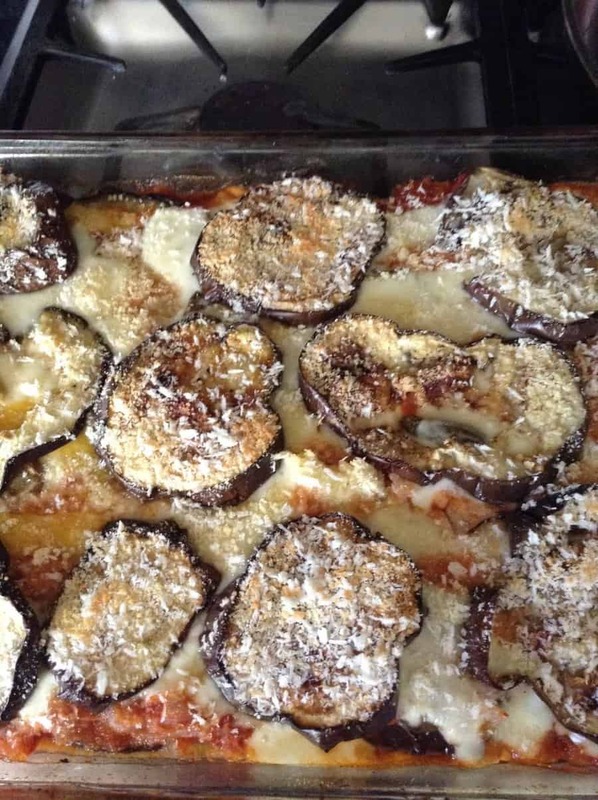 Place eggplant on a greased baking sheet. Drizzle with oil, salt and pepper. Bake at 450F until brown, about 15 minutes. In a baking pan, begin layering. Start with eggplant, then a layer of sauce, basil, one slice of mozzarella for each eggplant slice and some Parmesan. Repeat. If you have more eggplant and cheese, you can do another layer. Bake at 350F until the cheese is golden, about 20 minutes. Serve hot.